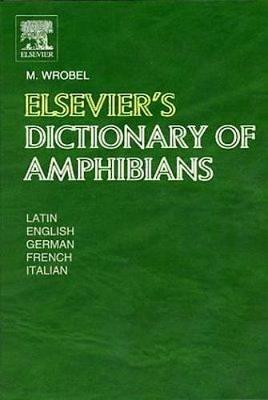 This dictionary lists the English, German, French and Italian names of amphibians occurring in Europe, North America, Canada, Central and Southern Africa, Australia and New Zealand, the Indian Subcontinent, South East Asia, Virgin Islands and Puerto Rico and the islands of the West Indies. It lists 5,367 scientific names of orders, families, genera, species and subspecies. The relevant order and family are shown for each term. The taxonomy is that used by the different authors of the sources.